Panaji is the state’s capital, while Vasco da Gama is the largest city. The historic city of Margao still exhibits the influence of Portuguese culture, who first landed in the early 16th century as merchants, and conquered it soon thereafter. The Portuguese overseas territory existed for about 450 years, until it was annexed by India in 1961. Renowned for its beaches, places of worship and world heritage architecture, Goa is visited by large numbers of international and domestic tourists each year. It also has rich flora and fauna, owing to its location on the Western Ghats range, which is classified as a biodiversity hot spot. Goa’s sole airport, the Dabolim airport is serviced by the following carriers – Air India, Indian Airlines, Kingfisher Airlines, Go Air, Jet Airways besides Charter flights from the United Kingdom, Russia, Germany operated by Thomas Cook, Condor, Monarch Airlines etc. Goa’s public transport largely consists of privately operated buses linking the major towns to rural areas. Government-run buses, maintained by the Kadamba Transport Corporation, links both major routes (like the Panjim–Margao route) and some remote parts of the state. In large towns such as Panjim and Margao, intra-city buses ply. However, public transport in Goa is less developed, and residents depend heavily on their own transport, usually motorized two-wheelers. Goa has two National Highways passing through it. NH-17 runs along India’s west coast and links Goa to Mumbai in the north and Mangalore to the south. 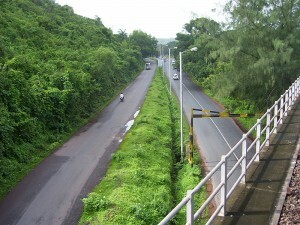 NH-4A running across the state connects the capital Panjim to Belgaum in east, linking Goa to cities in the Deccan. The NH-17A connects NH-17 to Mormugao Harbour from Cortalim, and the new NH-17B, is a four lane highway connecting Mormugao Harbor to NH-17 at another location, Verna, via Dabolim airport. Goa has a total of 224 km (139 mi) of National highway, 232 km (144 mi) of state highway and 815 km of district highway. Hired forms of transport include non metered taxis, and, in urban areas, auto rickshaws. A unique form of transport in Goa is the Motorcycle taxi, operated by drivers who are locally called “pilots”. These vehicles transport a single pillion rider, at fares that are usually negotiated. River crossings in Goa are serviced by flat-bottomed ferry boats, operated by the river navigation departments. The Mormugao harbour near the city of Vasco handles mineral ore, petroleum, coal and international containers. Much of the shipments consist of minerals and ores from Goa’s hinterland. Panjim, which is situated on the banks of the Mandovi, also has a minor port, which used to handle passenger steamers between Goa and Mumbai till the late 1980s. There was also a short-lived catamaran service linking Mumbai and Panaji operated by Damania Shipping in the 1990s. This entry was posted in Goa and tagged Asia, Dabolim Airport, Goa, India, Kadamba Transport Corporation, Konkan Railway, Panaji, Vasco da Gama. Bookmark the permalink.